I always like to work on my stuff wherever I am. Perhaps this is due to my role as a PhD student and also an academic staff, or I am just addicted to Internet. I have an IPad for about two years. But most of the time I just can’t do things with IPad — I need a real keyboard with bigger screen. My friends always take me as a weirdy when I take out my Samsung Chromebook in office or coffee shop. They always curious how I going to survive with this “Internet-oriented machine”. Generally, the Chromebook is not that popular in Malaysia as compared to IOS or Android tablet. Still, I find the Chrome OS (operating system to run the Chromebook) interesting and cool and bought it second hand in a good deal. This is my experience with Samsung Chromebook after using it for about a month. The Samsung Chromebook is light and has about 6 hours battery life. Additionally, the Samsung Chromebook has an impressing sleep function (standby mode) — it takes about 1 second to wake up from or go into the sleep mode. Imagine that you just need to open the lid to start you work and close the lid when you decide to go. No waiting needed. Additionally, Samsung Chromebook has a comfortable keyboard and nice touch pad. I can scroll the browser with two fingers and switching the tabs with three fingers, etc..
As a PhD student, I need to work on the computer software such as Python and Sage. Basically, I can run Python in Cloud9 (only one private project per free account) and Sage on its own web app. Nonetheless, I still prefer work my coding in the real machine instead of cloud because of the data safety issue — I feel insecure to leave my research work in cloud. Reading research papers is a must-do activity for a PhD student. Generally, the research papers are in the PDF form. We can read the PDF with Chrome browser or Google drive viewer. However, there isn’t much choice if we want to have annotate the PDF. Both PDFZen and Crocodoc provide free PDF annotation services. Basically, PDFZen is able to retrieve the PDF from Google Drive and store it back afterwards, but it is unstable after all. Comparatively, Crocodoc does not link with Google Drive — the user needs to upload the PDF manually to the website manually and download it back to Google Drive after the annotation. I prefer Crocodoc though it is not that convenient. Most PhD students prepare their research paper with Latex rather than MS Word. I prefer the ShareLatex but WriteLatex seems to have a better interface. In fact, I still prefer to prepare the research paper with Lyx, a beautiful Latex word processor but it only runs in Windows and Linux. My university uses MS Word a lot in official documents. I found Zoho Doc (link-able with Google Drive) handles the MS Word much better than Google Doc and Quick Office. Most of my lecture slides are prepared with LibreOffice or MS Office. Some of my meeting records and plans are prepared in Google Doc. I like Evernote. It is free and upgradable for better features and capacity. I use it a lot for brainstorming ideas. Hangout is a chatting app, something like Skype. And, it is fun. You can video call your friend with some entertaining effect in the video. 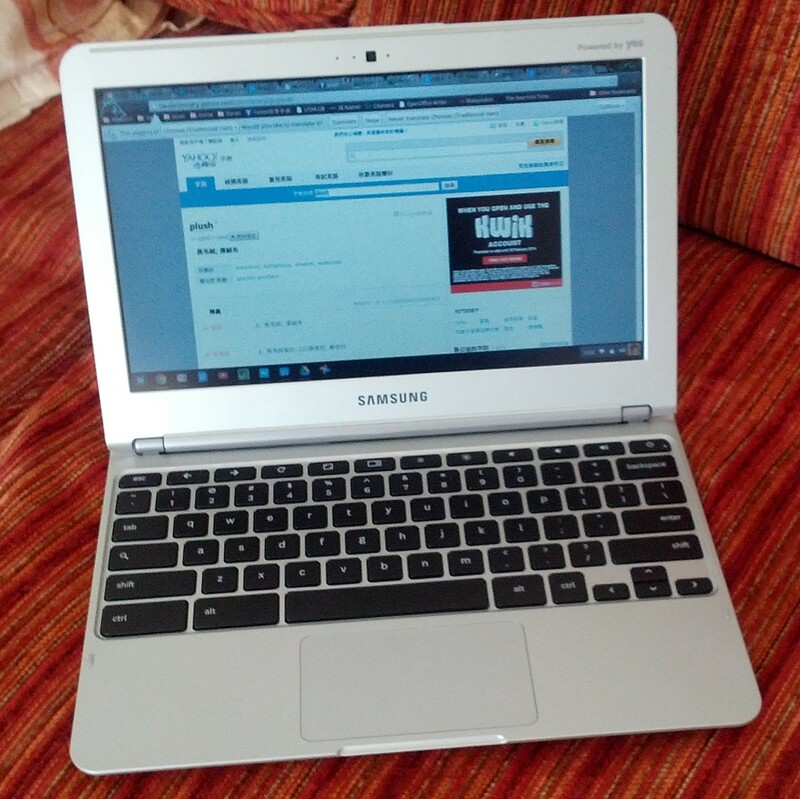 Perhaps Samsung Chromebook is just an Internet browser machine. Like Pirillo said, “I bought it for what it is, and not for what it is not“. There are still room of improvement for the apps and I am concerning on the safety of the data stored in cloud. Other than these, Chromebook is a good cool machine and I enjoy using it.